Having been asked by the editor to review the double CD 'Quadrille Mania', my first thought was 'what do I know about quadrilles?' - I believed them to be dances from the 19th century, in square formation, and that The Lancers was a version. Not a lot to go on! It was soon obvious that for a full picture of the development of the quadrille form we need to go back to an earlier period and look at the English Country Dance - so a short essay drawn from my research on the subject follows the body of this review. Many of the quadrille sets mentioned in the essay below evolved, with their numerous variations, to become the folk dances of the Australian bush. They lasted much longer in small rural communities than in the towns, although today the Alberts is the main survivor, often being dance straight through with no break between figures. Another interesting dance is the Parisian Quadrille, which is the First Set danced without side couples, i.e. back to being a longways! The Bush Dance and Music Club of Bendigo and District have been instrumental in reviving interest in the quadrilles and responsible for a great deal of research into both dance variations and the music for the sets. 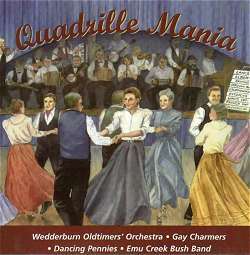 The revival in the mid 1970s, of the Wedderburn Oldtimers Orchestra led to a renewal of interest in the old dances, and some of the sets were regularly used at local dances. They have researched versions from all over Australia and collected dances and music from a variety of sources, including Italian and Swiss-Italian tunes brought over in the 1860s. A chance encounter at the National Folk Festival in Sydney in 1980 resulted in a meeting with a Mr Bull, then in his eighties, who still had the music for the First Set written out in 1910 by his German music teacher, a version of which is included on this recording. Thanks to the work of the Bendigo Club the Quadrilles have now become much better known to a wider audience, and continue to be danced with great pleasure. I would draw a parallel between the rekindling of interest in the quadrille sets in Australia and the growth of interest in this country in Irish Set dancing, as evidenced by the many workshops and dances at festivals and at regular venues throughout the country. These are by no means attended only by the Irish or those of Irish descent but have become popular across a wide spectrum of dancers. What of the CDs themselves? Here we have the music arranged to dance to, that is each of the dances has sets of tunes played the correct number of times through for each figure in the quadrille. For example the Lancers, fig 1 x 8 bars intro then 4 x 32bars, fig2 - 4 x 32 bars, fig3 - 2 x 32 bars, fig4 - 4 x 48 bars and fig 5 - 4 x 48 bars plus coda. (An interesting one is for the Waltz of Cotillions which has 4 x 128 bars plus coda!) The dances also include the Alberts (3 versions), the Caledonians, the Prince Imperials, Exions and a couple of versions of the Waltz Cotillon. The booklet accompanying the CDs gives the 'calls' for all the dances with some explanation of the figures, most of which will be familiar to any regular dancer e.g. ladies chain, right and left through, set and turn, circles , stars etc … The Bendigo Club will also be producing a video of the dances to demonstrate how they are done. There is music for the twelve dances and as most of them have five figures and a medley of up to six tunes is used for each figure, this means an opportunity for a wide variety of melodies. A lot of tunes used would be very familiar to any traditional musician or dancer in this country, e.g. Redwing, Garry Owen, Long Way to Tipperary, Golden Slippers, McNamara's Band, Rakes of Mallow, etc. . along with other popular tunes such as Hi Ho the Merrio, Wheels and even The Band Played Waltzing Matilda. Scottish tunes are well represented with Invercauld, Jock O'Hazeldean, Mount Stewart House, Annie Laurie and the Fairy Dance amongst others. Along with these are a few tunes of European origin, such as Luedecker Polka and Herr Geisler's 1st and 2nd tunes, and several home grown Australian tunes e.g.. Harry Cotters See-saw Polka, the Mudgee Waltz, Shaver Ramsey's and the Cahling Gervisoni Waltzes from Yandoit. Most of the tunes for the waltz sets would have been in the repertoire of the majority of old musicians throughout England too. Villikins and His Dinah, If those Lips Could Only Speak, When It's Springtime in The Rockies, Peggy O'Neal and When Irish Eyes are Smiling, are just what would have been popular a few years ago at any Saturday night session in an English pub. As a musician, it's not really the sort of CD I would buy in order to learn new tunes - although some of the Aussie ones are excellent and will no doubt find their way into my repertory - but the music is played with great vigour and energy and would be wonderful for dancing to. My favourite band are the Gay Charmers who, although only a four piece, have terrific punch and drive, and also a wonderful piano player. All the bands play well and with great enthusiasm and it seems obvious that the musicians are having a jolly good time. It has the joyful feel of some of the stuff that would have been played by old musicians in Britain many years ago, and that Old Swan Band, Flowers and Frolics, New Victory Band and others so successfully revived here in the 1960s/'70s. Although we have to wait until 1650 and the publication of Playford's Dancing Master to get technical information, there is no doubt that Country Dance was popular in 16th century England and probably earlier. Many of the dances Playford describes are of an advanced character and must have been the result of development over generations. Three of the dances published in the first edition were casually mentioned nearly a hundred years earlier in 'Misogonus', a comedy of c. 1560, as being everyday popular dances. By the end of the 16th century Country Dances had penetrated into the Court. In 1602 we have the Earl of Worcester writing "We all frolic here at Court, much dancing in the Privy Chamber of Country Dances before the Queens Majesty, who is exceedingly pleased therewith"
At first these Country Dances did not replace the Branles, Courantes and other French dances for the main part of a Court dance, but were used at the end of the evening as a lighter form of enjoyment. They did however flourish amongst the middle classes and also in the social life of the villages. The Country Dance was a figure dance using simple steps but often with elaborate figures - developed from the earlier folkdances, and whilst retaining some of the basic qualities of the previous forms, showed considerable development in technique. Essentially a dance for at least four people, and which - in contrast to the sedate and serious music of France and Italy - used an almost infinite variety of bright, jolly, rhythmical tunes. In Europe the centre of dance was the French Court, especially in the latter half of the 17th century. Double Branles, Corantos and Gavottes were still the favourites, albeit more and more formal and relying on ever more complex and technical moves. In England the Country Dance was as popular as ever, despite the advent of the Puritans - in fact the English Dancing Master was first published only three years before the Commonwealth, and a second edition two years later. It is clear that although French dances were still utilised by the English Court to start an evening, they were followed by Country Dances, even though the more formal Longways sets were replacing the earlier Rounds and Square-Eights. The beginning of the 18th century marks an important point in the history of social dance in Europe. Dances had grown ever more complex, stilted and affected and gave less and less pleasure to the participants. So these Court dances were gradually rejected and replaced by the English Country Dance. During the previous century these English dances had also started to find favour on the continent. The earliest evidence is the first collection of English dances to be published abroad, Recueil de Contredanses by Feuillet (Paris, 1706) which contains 32 Longways dances. 'All the contredanses to be found in this collection are original examples chosen from amongst the finest and most fashionable and are printed as they are danced in that country'. They may well have been amongst the finest, but were certainly not all recent examples: five appear in the 1686 (7th) edition of Playford's Dancing Master; two were first printed in 1670; and one in 1690; the others being composed 'after the English model'. Contredanse is nothing but a dance figure repeated continually - first by two, by four, by six, by eight, by ten and finally by as many couples as may be present. A figure in respect of a Contredanse is a certain number of movements capable of filling out an air. One Contredanse can have several figures, which may be regarded as several verses of a song sung to the same air. That the English Country dance had also reached other parts of Europe is evident from the following quotations. It may be worthwhile now to look at the derivation of the word contredanse. For a long time England had looked to France for what was thought fashionable in dress, manners and dance, and many people found it hard to believe that we were successfully exporting our own culture to the French. Because of the similarity of the names of the dance (Country Dance and Contredanse) they thought that the dance form was French in origin. This idea even persists into the present, so it is worthwhile considering the facts. The English historian of the dance (Weaver) had no doubt of the origin of the dances calling Country Dance "the peculiar Growth of this Nation" (1712), nor did Feuillet (1706) "The English are the first inventors. " Jaques Bonnet states in 1723 that the Contredanse had been "introduced by an English dancing Master some 12 to 15 years before." So given that it was generally accepted that the dances were English, how the word 'contredanse' got into the French language is interesting. It is not in the 'Dictionnaire Francois' of 1690 or in the edition of 1710 (but is in the Amsterdam edition of 1722), nor is it found in the first 'Dictionnaire de l'Acadamie' (1694) but does appear in the 1718 edition. It is possible that Feuillet used it in the sense of contreé-danse with people placing themselves opposite to one another to begin a figure - as the only form of Country Dance he published was the Longways where 'contre' (opposite) would have some meaning. However Bassompierre also used the term in 1625 when the dances he knew would have also included the earlier Rounds and Square-eights etc. If Country Dance meant figure dancing to the English, Contredanse meant repetition to the French - which was commonly called Contrepartie (counterpart) another possible origin of the name. Since at least 1560 the word Country Dance was used in England as a generic name for our national dances in various formations. Before the 18th century the word contredanse only occurs once in French literature, when it was used as the French equivalent of English Country Dance. The word was not in general use in France until 1706 when Feuillet published his collection under that title. During the first 30 - 40 years of the 18th century it was used in France exclusively to denote English Country Dance in longways form. Through history there has been an unwritten law - 'the dance must fit the dancing space'. The English danced in large public assemblies where longways formation was appropriate, whilst the French danced at home in salons often almost square in shape, and so made their own adaptation of the contredanse into a square for eight. This was called the Contredanse Francaise or Cotillon. The Cotillon was originally a French folk dance ('cotte' being the short petticoat worn by peasants) In modified form it was introduced into England about 1770, and soon found favour. So much so that from 1780 publishers included 'New Cotillons' in their annual publication of New Country Dances. It was danced here as a French dance, and in the same way that the French had turned our longways set into a square for their convenience, so the English turned the French dances into longways to suit our conditions. In some of the later collections a dance might be given in two forms so that it could either be danced as a Cotillon (or Quadrille) or as a Longways Progressive set e.g. Harbours Allemande as arranged in La Marquise an English collection of the late 18th century. Dezais includes the Carillon des Fetes de Thalie (with the subtitle 'Contredanse') in his Recueil of 1716 - this dance maintains the principle of repetition in that each figure is led by the top and bottom couples then repeated by the side couples, and between the figures a chorus or refrain is danced, again led by the heads and repeated by the sides. Grand Rond - a circle left and right. Gentlemen Moulinet - Men the same. Ladies Hands Four Ring - once round each way. Partners Allemande - 'to allemande is to face in opposite directions, each puts the right hand behind their back and with the left they take their partners right. In this position they go round once then turn to repeat with the left hand behind the back'. (Like the hold we now use for the swing in The Hullichan. Grand Rond - as before. This fashionable species of dancing is entirely of French origin and only differs from the well known dance the Cotillon, by leaving out the changes (Tours); being much shorter, and frequently composed of figures that require but four persons to their performance. . . although eight persons generally stand up for the sake of convenience. . . and also to gain room in the formation of the sets, particularly as many of the Cotillon figures are now introduced in Quadrille dancing that require eight persons. … so it seems that what started as a two couple simplification of the Cotillon became after a while almost indistinguishable as it often needed four couple square sets. In the first quarter if the 19th century Country Dance held its pre-eminent position in the ballrooms of England - although the two dances that were eventually to replace it were both introduced early in the century - the Waltz in 1912 and the Quadrille in 1816. Many publications reflect the remarkable interest in dancing following the Napoleonic wars describing it as being 'the most popular amusement of all classes'. The Quadrille was introduced into English Society by Lady Jersey and her friends at 'Almacks' in 1816. Originally figures were put together by the dancers themselves, but Wilson's Treatise on Quadrille Dancing of 1818 describes fifty different moves and suggests how they may be combined to make figures. Many of these moves were Cotillon figures already familiar to English dancers. One of the most popular books of the period was Payne's Six Sets of Quadrilles (1820) - the First of which was a Set that was already so popular in Paris that by the end of the 18th century it had superseded all the others. This was the set which Lady Jersey introduced at Almacks and ultimately the form in which the Quadrille was danced in England, as the First Set of the Quadrilles, although there were numerous variations to chose from. It usually consisted of five distinct parts or figures - which even when new music was provided retained the name of the contredanses which made up the standard quadrille. The figures were: Le Pantelon, adapted from a song which began 'le pantelon / de Madelon / N'a pas le fond …' L'Ete - a contredanse popular in 1800 La Poule - a dance from 1820 La Pastourelle - based on a ballet by the cornet player Collinet, and a lively … Finale. The fourth figure - La Pastourelle - was often replaced by a further figure La Trenis (named after the dance Trenitz) in fact, in the Viennese Quadrille both were danced - as fourth and sixth figures. The music for the quadrille sets was made up of lively rhythmic themes of rigid 8 or 16 bar lengths - the sections much repeated within a figure. Except for La Poule and sometimes Le Pantelon (which were in 6/8) the music was in 2/4 and usually adapted from popular songs and stage works. In England the Quadrilles of Jullien, such as the British Army Quadrilles and the Grand Quadrille of All Nations were great attractions at his concerts in the Surrey Gardens and Covent Garden. Elgar also wrote music for the Quadrilles during his years as conductor at the Powick Asylum (1879-94). Elsewhere in Europe quadrilles were produced by the Stausses and all the major dance composers of the 19th century. As examples of the popularity of the Quadrille in the ballrooms of the period are a few samples of dance programmes. The Lancers 'A second set of quadrilles with entirely new figures, as danced by the nobility and Gentry of Tenby in the Summer of 1819' was compiled by Joseph Hart and published in 1820. This also has five figures: La Rose, La Lodaiska, La Dorset, Les Lanciers and L'Etoile. The tunes were again usually adaptations of operatic airs and popular tunes of the day (the tune to La Dorset was Poor Robin's Maggot from Playford - also used in the Beggars' Opera for If the Heart of a Man). By the 1830s The Caledonians - possibly an English arrangement to Scottish tunes appeared and then the Waltz Cotillon (sometimes spelt Cotillion) evolved, most likely from figures of the 'party' type Cotillon. A French composer Charles d'Albert, resident in England, arranged a mixed set by sequencing favourite figures from the First Set, Caledonians, Lancers and the Waltz Cotillion. Thus the popular Alberts Quadrille came into being. As the Quadrilles percolated through different levels of society and between different countries they hybridised with earlier dance styles to create new forms of dance. In Ireland many of the sets evolved by absorbing traditional Irish stepping into the quadrille format, and American Square Dancing came from the same source, as did some of the Scottish Country Dances, including the Eighsome Reel. In Australia the versions remained more closely linked to the British originals, but with interesting variations and combinations of figures, for example the Fitzroy Quadrilles and the Exions (sometimes Exiles). In Western Australia several 'party or club sets' have been found on dance programmes from the 1890s to 1912, including The Metropolitan, the Robbie Burns and the Masonic Quadrilles. The Quadrille (and Lancers) soon became very popular in England and although in the original form, as received from France, it depended for effect on elaborate steps, these were gradually discarded and the dancers simply walked through the complicated figures ....... Now what does that remind me of ??? As the popularity of the Quadrille and Waltz increased, so that of the English Country Dance diminished. The Polka (a Bohemian dance) was introduced in 1845, followed by the Schottische, the Mazurka and the Redowa - all of which helped to displace the Country Dance from the prime position it had held for two centuries. Towards the end of the 19th century the Quadrille and Waltz and other more recent dances were in turn losing favour, certainly in England, and for the first time (and by no means the last) we took up dances from the Americas, the One Step from San Francisco, the Boston Waltz and the Argentine Tango. The Lancers retained some of its popularity and was to survive well into the 20th Century.